We’d love your help. 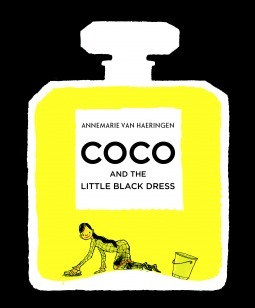 Let us know what’s wrong with this preview of Coco and the Little Black Dress by Annemarie van Haeringen. To ask other readers questions about Coco and the Little Black Dress, please sign up. Hmm... this was interesting and the images were cute and cleverly formatted. They reminded me a bit of Madeline. The originality depicted in the cover image is representative of the style and thinking of the other illustrations. This is a very simplistic biography as is benefitting a children's picture book, but clearly this is for slightly older readers than the preschool through 2nd grade. Assuming that the message one is imparting to young girls is that hard work, not following the crowd and making your way your own way are the objectives and not promoting being cute and fashionable. Overall, the message of listening to yourself and not following the crowd was well done. Can a woman build their own path? Of course. Really need be rich or get marry to be someone important in this world?not at all. This books present us to Coco Chanel, one powerful women that could create their rules and get successful thanks to that. I must say that the format of this books is absolutely pretty, the pictures are so simple but transmit the scene message and the colors are pale but strong with the aesthetic. For a biography gives information enough to meet Coco but, because it is ma Can a woman build their own path? Of course. Really need be rich or get marry to be someone important in this world?not at all. This books present us to Coco Chanel, one powerful women that could create their rules and get successful thanks to that. I must say that the format of this books is absolutely pretty, the pictures are so simple but transmit the scene message and the colors are pale but strong with the aesthetic. For a biography gives information enough to meet Coco but, because it is made for childrens, is written in short paragraphs with puntual information. Probably if you don't care fashion at all or if you think that is something vain you won't be interested at all in this book, but you should read it because have a powerful message that just a few books transmit and can inspire you that to not become a sheep. Єдиний незнайомий факт з життя - Коко Шанель співала в кабаре. This is a gorgeous little book about the life and times of Coco Chanel. From the orphanage that she grew up in to the rich and glamorous life she lead later on, this book is a lovely introduction for children to the life of one of the most famous names in fashion. Simple text and illustrations allow the story of Coco to shine. When you hear the name Coco Chanel what do you envision? Maybe a stiff clothed fashion mogul. Maybe you recall her perfume and its infamously expensive ad campaigns. What you probably don’t picture is a Cinderella type orphan, scrubbing floors and working long hours of every day. Coco was raised in an orphanage and in that setting she learned to sew and design clothes. When she left at eighteen years of age, she wasn’t sure what she was going to do but she was certain that whatever she did it wouldn’t include being poor, and unlike Cinderella, this orphan didn’t need a prince to make her dreams come true. She noticed that many women’s clothes were restrictive and form-fitting. She designed a string of more comfortable yet professional clothes and is given credit for creating the little black dress. The illustrations are spare but sweet, as is the story. It is a slight but accessible story that encourages kids to work hard to make their dreams come true. It felt like this book doesn't really know what kind of book it wants to be. It calls itseld a non-fiction children book, but I think I wouldn't be interessted in a book like this as a child. The sentences are simple, but some words are difficult. The drawings are simple and minimalistic. Its made very well, but I don't k It felt like this book doesn't really know what kind of book it wants to be. It calls itseld a non-fiction children book, but I think I wouldn't be interessted in a book like this as a child. Simple but very elegant illustrations. Helps glorify the story of the creator of the little black dress. The story seemed to jump around a lot. If a child was reading this, it would leave them confused. A good way to start learning about the great Coco, but if you are looking more than a few bits and pieces, look elsewhere. How Coco Chanel grew up to become a world famous fashion designer and master of luxurious simplicity. Van Haeringen's spare mixed-media illustrations perfectly reflect Chanel's devotion to simplicity. A charming picture book biography that brings to mind the work of Ludwig Bemelmans. The woman who taught us that to be comfortable is to be chic, in loose-limbed drawings full of joie de vivre. A minimal book that tells the story of Coco Channel as a young orphan girl and how and why she became a designer. 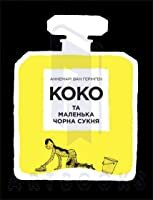 Книжечка «Коко та маленька чорна сукня» від нідерландської авторки Аннемарі Ван Герінген - це коротенька історія з милими та тендітними ілюстраціями, що розкажуть про дівчинку, яка своєю вірою та запалом підкорила і змінила цей Світ - про маленьку Коко. Коко, вона ж Габріель Шанель, стала однією з легенд в історії моди, відома своїм революційним поглядом на жіночність. Саме завдяки її розумінню краси та елегатності, світ моди зазнав кардинальних змін. Саме завдяки її духу, таланту та мріям ми ма Книжечка «Коко та маленька чорна сукня» від нідерландської авторки Аннемарі Ван Герінген - це коротенька історія з милими та тендітними ілюстраціями, що розкажуть про дівчинку, яка своєю вірою та запалом підкорила і змінила цей Світ - про маленьку Коко. Коко, вона ж Габріель Шанель, стала однією з легенд в історії моди, відома своїм революційним поглядом на жіночність. Саме завдяки її розумінню краси та елегатності, світ моди зазнав кардинальних змін. Саме завдяки її духу, таланту та мріям ми маємо Маленьку чорну сукню та відомі парфуми Chanel №5. Книжка для усіх хто як і вона вірить у те, що робить чи хоче робити. І як казала прекрасна Коко Шанель - «якщо ти народжений без крил, не заважай їм рости!». I read two pictures about Coco Chanel today and even though this one didn't fully go into her biography I liked this one a lot more because it was more body-positive. It showed larger women in a positive light, where the other one was demeaning and left me with a sour taste in my mouth. Needless to say, Coco Chanel had a lot to do with shaping our skinny-or-else culture, but this book didn't make me feel bad about myself by the end of it. This a nice introduction to Coco Chanel. I think it would do best with a parent/child reading together so that the parent can focus more attention on how Coco worked her way to the top instead of focusing on "looking pretty" and being "rich", etc. But it's a nice intro and maybe kids will want to read more. Simple and easily digested bio on Coco Chanel. Van Haeringen’s heavy use of black and white (with light touches of color) lays a foundation for Chanel’s signature style. Rey well conceived and styled book. The pages displaying various hats and finally dresses are the showstoppers. I gave this book 3 stars because the pictures are a little inappropriate (women in bras and underwear) to show to a class of students and does not transition well. A very simplified picture book biography of Coco Chanel. 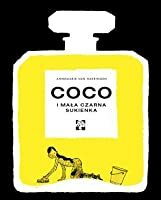 I would recommend "Different Like Coco" as it has better images and the wording is less jarring. Loved the images, but for a book that was labeled as a biography for Coco Chanel, it was highly disappointing. Sounded more like a fiction storybook instead of a biography. Annemarie Van Haeringen's COCO AND THE LITTLE BLACK DRESS was my daughter's and my first foray into children's nonfiction (other than nature books). This award winning book tells the story of the rise of famed fashion designer Coco Chanel. While the name Coco Chanel is probably familiar to most, I knew little about her life. This book is an uplifting tale for kids about how one can start with a humble upbringing, in an orphanage no less, and persevere to become one of the most recognizable names Annemarie Van Haeringen's COCO AND THE LITTLE BLACK DRESS was my daughter's and my first foray into children's nonfiction (other than nature books). This award winning book tells the story of the rise of famed fashion designer Coco Chanel. While the name Coco Chanel is probably familiar to most, I knew little about her life. This book is an uplifting tale for kids about how one can start with a humble upbringing, in an orphanage no less, and persevere to become one of the most recognizable names in fashion. This 32-page book tells the story of how Coco paved her own path, was willing to take chances, and explicitly tried to disrupt the fashion world. The book is geared to children as young as four years, and my daughter was able to appreciate and follow it. As a parent, it is always nice to learn something from reading, and I did with this book. The book begins in the orphanage where Coco learned to sew then follows her career and how she observed how the rich and famous acted, but Coco was always astonished as their fashion choices. She sought to stand out from the crowd. Coco Chanel's story is fascinating, and the book does a great job of putting her story in language that a child can follow. I saw this book on *Netgalley and was immediately intrigued. Coco Chanel is an iconic figure and I thought to myself a children's book about Coco? Heck yeah! Little Coco is raised in an orphanage and is made from a young age to feel different and not wanted. In the orphanage she learns to sew and dreams of bigger things. When she is older she makes friends with rich people and soon begins to design her own hats and clothes. Including the iconic "little black dress". OK so I loved this book. The dr I saw this book on *Netgalley and was immediately intrigued. Coco Chanel is an iconic figure and I thought to myself a children's book about Coco? Heck yeah! OK so I loved this book. The drawings were wonderful. I loved the look of the fashions and the story of little Coco. I admit though I'm not a fan of the perfume. I know I know! Every woman is supposed to love Chanel #5...but little old me? I just always found it to be...a bit much. But anyway back to the book. I found it fascinating to learn that she was raised in an orphanage even though she wasn't really an orphan. I love that she always wanted more for herself and worked hard for it. And since she was never afraid to be different. My son didn't do as well with this book. To be honest though he doesn't care about fashion so this book really isn't catered to him. I think this really is better for young boys and girls who care about fashion. Really this is more towards young girls than boys (but some boys may enjoy this book). I would say 4 out of 5 stars. A picture book biography about how Coco Chanel went from an orphanage to height of fashion designers. The beginning of this with Coco in a French orphanage reminded me of Madeline perhaps also because of the art style, but it quickly differentiated itself. It was interesting to learn that Coco really got her foot in the fashion design door with hats first and then branched out to other things (at least that's what I understood from this, I'm not sure if that was 100% how it was in real life...bec A picture book biography about how Coco Chanel went from an orphanage to height of fashion designers. The beginning of this with Coco in a French orphanage reminded me of Madeline perhaps also because of the art style, but it quickly differentiated itself. It was interesting to learn that Coco really got her foot in the fashion design door with hats first and then branched out to other things (at least that's what I understood from this, I'm not sure if that was 100% how it was in real life...because of the brevity of this book, there's only a very little bit of info conveyed). There are not a whole lot of books out there on fashion designers for kids, so this is a nice addition to the library. It also has a little bit on the evolution of women's fashion thanks to Coco's daring designs. My favorite part was Coco's comment about the current hat fashions. "How can you think with a dead pigeon on your head?" I find it hard to review a children's book, not having kids of my own with whom to read them. Not everything can be as clever and deep as Dr. Seuss, or as elegant and visually striking as Oliver Jeffers, and judging a book meant for someone 30 years younger, can be a tricky. That said, I really liked Annmarie illustrations. They’re simple, beautiful and stylish, very fitting for the subject matter. As for the narrative, I liked it, but i just don’t know if it achieves what it’s looking for. Maybe I find it hard to review a children's book, not having kids of my own with whom to read them. Not everything can be as clever and deep as Dr. Seuss, or as elegant and visually striking as Oliver Jeffers, and judging a book meant for someone 30 years younger, can be a tricky. As for the narrative, I liked it, but i just don’t know if it achieves what it’s looking for. Maybe I was trying to find a clear life lesson, and there isn’t one (although many can be inferred, as deciding what you’re aiming for or following your own path). Maybe I found the description a bit simplistic, but suddenly muddled with some complex words (as jodhpurs or supple). But really, what do I know? My favorite books are Fight Club and High Fidelity, so I’m not the best judge for this one. This bare bones biography features a plain sparse drawings and descriptions of Coco's early life in an orphanage, learning more about what women’s fashion was like, and coming up with her own way to change things. This book reduces a fascinating, enigmatic, and talented women into an incredibly dull story with drab and uninteresting imagery. I wouldn’t add this to my library, as there are images of adult women in their underwear. I would add a biography that had photographs and more information. I am not digging some of these picture book biographies coming out lately that seem more about the artsy illustrations than the person themselves. I would consider myself a Coco fan, and this book still doesn’t appeal to me. EL –NO Reviewer: Stephanie Elementary School Librarian & Author. If you haven't heard of Coco Chanel, then I don't know which planet you are living in. She is well known for her infamous Chanel No. 5 scent, the Little Black Dress, and the classic Double C logo on every girl's dream bag. Before becoming a legendary fashion designer, she actually has a rags-to-riches back story that Annemarie van Haeringen was able to depict in this illustrated children's book. It's quite a cute story that not only little girls can enjoy, but also their moms. It actually remind If you haven't heard of Coco Chanel, then I don't know which planet you are living in. She is well known for her infamous Chanel No. 5 scent, the Little Black Dress, and the classic Double C logo on every girl's dream bag. Before becoming a legendary fashion designer, she actually has a rags-to-riches back story that Annemarie van Haeringen was able to depict in this illustrated children's book. It's quite a cute story that not only little girls can enjoy, but also their moms. It actually reminded me of Madeline because of the very French feel of the story. It's also a simple way to relay a biography to all the readers out there because it's visually entertaining and concise. I also appreciate the fact that it's empowering little girls to be different and to reach for their dreams. This is a really great kids' book about Coco! It is all about perseverance and trying hard to achieve your goals. The art was adorable. It reminded me of classic children's book art, like Madeline or Roald Dahl's book covers. I can see a lot of kids who are interested in clothes or fashion enjoying this book. It also shows a wide range of people in its depictions, which is great for kids to see. Everyone needs strong female role-models like Coco as well. I'm not sure how engaging the writing sty This is a really great kids' book about Coco! It is all about perseverance and trying hard to achieve your goals. The art was adorable. It reminded me of classic children's book art, like Madeline or Roald Dahl's book covers. I can see a lot of kids who are interested in clothes or fashion enjoying this book. It also shows a wide range of people in its depictions, which is great for kids to see. Everyone needs strong female role-models like Coco as well. I'm not sure how engaging the writing style would be for young kids at times, but it's fun, the art is eye-catching, and I'd love to have it in my classroom library!